As the newsletter matures and becomes more of a true community forum for the Wireless Messaging industry, my job gets easier because I get so much good information from experts in various fields. This week I am pleased to publish the second in a series of articles about Location Based Services (LBS) by my friend Brooks Marsden of GTES. I also received news from Graeme Hull at Multitone Electronics about their new product, AlarmCentral™. Yet another friend went digging through various SEC filings to report the identity of three ex-USA Mobility Executives who were recently paid a lot of money through an arbitration settlement. Also, in this issue, SkyTel announces a dynamite new Location product called SkyGuard™ — primarily focused on giving parents peace of mind while their teenagers are out with the family car. Great idea! Check it out. Barry Kanne, president of TGA Technologies, is well-known all over the world for his work of forty-plus years in Radio Communications and Paging. Barry announces his retirement in the READER'S COMMENTS section below. Please join me in wishing Barry and his wife Judi good luck and much happiness as they begin this new chapter in their lives. I have many "war stories" that I could tell about things Barry and I have done together over the years. One of them—forty-some years ago—was when I was on a St. Thomas mountain top in the US Virgin Islands. My boss and I were installing a new Motorola IMTS car telephone system for the governor. We had been working on the control terminal all day and couldn't get it to place a call out over a telephone line. We had taken the equipment apart and put it back together several times. We had read and reread the manual and had checked and rechecked all the switch and jumper settings—it still wouldn't work. Then we heard a call coming in over the microwave orderwire from Puerto Rico. It was Jimmy Acosta the owner of the Motorola shop in San Juan and he had Barry with him. We told Barry about the trouble we were having with the terminal and he asked us if we had dialled "9" to get an outside line? We said, "no, why should we do that, it doesn't say anything about it in the operation manual?" After he insisted, we tried it and it worked! We sure were happy, but a little embarrassed as well. Then there is the story about troubleshooting a Radiotelephone installation in a brothel in Brazil, and then many years later, some adventures in Austria, but to hear those stories it will cost you a cup of coffee sometime. I will be attending the AAPC Wireless Forum in Myrtle Beach, South Carolina next week, so there will not be a regular issue of the newsletter until the following week. Location Services: Is This a Business for You? When pondering the idea of venturing into a new marketing endeavor one has to look at all the requirements for success. These maybe as simple as: do I have the right customer base? How different are the requirements for this opportunity from what I am doing today? Can the current sales staff move into this space and be successful? Do they have the right contacts within the current customers, and will these same customers see a value in the new offering? In our last article we looked at the similarities between the paging industry and the location services space. With closer scrutiny, it becomes apparent that there are many aspects that line up well, but some that don’t. Starting with one segment that is a good fit, the Health Care vertical certainly has an acute need for location services to help manage “rolling stock” in their complexes. So let’s work from this point. What other industries support the medical community? EMS, food suppliers, delivery companies, couriers that deliver valuable samples and medicines; these may be new opportunities, or ones that have slipped through our fingers for one reason or another. The list of companies that support the Health Care vertical is very lengthy, so how do you home in on the best opportunities? With the benefits in hand, consider who in the organization will recognize these benefits, and then translate them into the specifics of how they will help the target customer’s situation. Let’s go back and look at the location of rolling stock in a medical facility. Who is it that needs this equipment? Obviously patients are the “end customers” but it is the hospital staff that is tasked with finding, transporting, and maintaining this equipment. Once again we are lucky because the groups primarily responsible with managing this equipment are easy to identify. Bio Med and Transportation are the folks that keep it all running and deliver the needed equipment when and were it is needed. Other areas of the institution that benefit both directly and indirectly are Purchasing and the CFO. Purchasing normally has to compensate for the fact that rolling stock gets hoarded in certain areas of the hospital, so they purchase or lease a couple of extra pieces to take up the slack. This practice causes the CFO pain, as it results in higher costs than would be necessary with a more efficient allocation of resources. The Health Care Industry is one that the paging industry has developed close ties to, and which has been very well served through the provisioning of added services. Location services have long been identified as a potential benefit to this community of users, but up until now the technology has not existed to allow it to be used effectively. The technology has finally caught up with the need. WiFi location services are being delivered and now are being requested by the leading Medical institutions in North America. In the next article we will look at location opportunities in the shipping and AVL space. 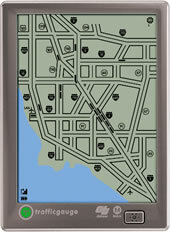 Looking forward to seeing you at the 2005 premier Paging conference! Thanks to our Wireless Forum sponsors! It is not too late to exhibit at this premier paging event! Click here for the exhibitor opportunities and exhibitor contract. We invite you to join with us to be part of building a strong organization that represents the interest of your business: the paging industry! AAPC enables members to continually set new standards of excellence as the industry’s leaders in providing quality and profitable communication services. Together, we can help you advance your business goals. 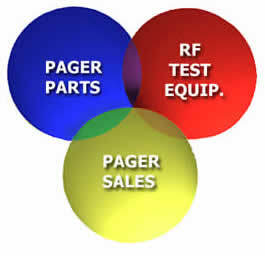 We look forward to working with you throughout 2005 to advance the paging industry. ALEXANDRIA, Va., May 27 /PRNewswire-FirstCall/—USA Mobility, Inc. (Nasdaq: USMO), a leading provider of wireless messaging services, today announced several management changes as it continues to integrate the operations of Arch Wireless, Inc. and Metrocall Holdings, Inc. which merged on November 16, 2004. Stan Sech, chief operating officer, will be leaving the company effective June 30, 2005. In his role as COO, Sech has been primarily responsible for USA Mobility's sales and marketing efforts. Steve Pennington, currently senior vice president of sales and marketing, will continue to lead the company's marketing and national account sales. He will also assume leadership of the field sales organizations and will report directly to Vincent D. Kelly, president and chief executive officer of USA Mobility. Peter C. Barnett will assume the title chief operating officer effective July 1, and will continue leading the company's engineering, network operations, customer service, and information technology organizations. Barnett is USA Mobility's chief technology officer. Prior to the merger of Metrocall and Arch, he had served as chief information officer and senior vice president of operations of Arch Wireless. Also, George Z. Moratis, the company's senior vice president of finance and treasurer will leave the company effective June 30, 2005 to pursue other opportunities. Thomas L. Schilling, chief financial officer, will assume the additional responsibility of the treasurer's role and will continue providing leadership of the company's accounting, finance, financial planning and audit functions. Additionally, USA Mobility's three operating divisions of five regions each will be consolidated into two operating divisions of six regions each. "We continue to adjust our management structure consistent with our integration objectives of creating a low cost operating company," said Kelly. "When we merged Metrocall and Arch late last year, we formed a management team that was comprised of the 'best of the best' from each company. Peter Barnett and I have worked closely with most of the senior managers who are leaving. Stan Sech, George Moratis, Jeff Owens, SVP of engineering, Rob Chiatello, SVP of supply chain management, Dave Andersen, West Division president, and the other senior managers who will be leaving us have all been key contributors to our success. They have been loyal, hardworking and of the highest integrity. It has been a personal privilege and great honor for me to work with them over the years, and they will be greatly missed. However, the competitive environment in which we operate, combined with the progress we have made in our integration efforts to date, both necessitate and allow for these difficult decisions." The company also announced the resignation of William E. Redmond as a director effective June 6. Redmond recently accepted the position of president and CEO of another public company in an unrelated industry, and, as a result of his new responsibilities, said he was cutting back on his Board service. "I am proud to have served on the Boards of Arch Wireless and USA Mobility, especially in connection with the successful consolidation of Arch and Metrocall last year," stated Redmond. "USA Mobility is in very good hands under the leadership of Vince Kelly, his management team and the current Board, and has a clear vision for the future. I fully believe the consolidation of the two leading paging companies into USA Mobility will be an unqualified success." Kelly noted: "Bill Redmond was an integral part of our merger discussions and helped lay the groundwork for a successful transaction. He has been of great assistance to me and my team during these past several months and will be sorely missed." Royce Yudkoff, chairman of the Board of USA Mobility, echoed Kelly's comments, saying, "Bill provided leadership and wise counsel to our Board and we wish him well in his new endeavors." Safe Harbor Statement under the Private Securities Litigation Reform Act: Statements contained herein or in prior press releases which are not historical fact, such as statements regarding USA Mobility's merger integration and expectations for future operating and financial performance, are forward-looking statements for purposes of the safe harbor provisions under the Private Securities Litigation Reform Act of 1995. These forward- looking statements involve risks and uncertainties that may cause USA Mobility's actual results to be materially different from the future results expressed or implied by such forward-looking statements. 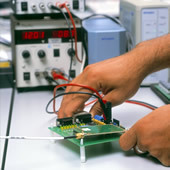 Factors that could cause actual results to differ materially from those expectations include, but are not limited to, declining demand for paging products and services, the ability to continue to reduce operating expenses, future capital needs, competitive pricing pressures, competition from both traditional paging services and other wireless communications services, government regulation, reliance upon third-party providers for certain equipment and services, the timely and efficient integration of the operations and facilities of Metrocall and Arch as well as other risks described from time to time in periodic reports and registration statements filed with the Securities and Exchange Commission. Although USA Mobility believes the expectations reflected in the forward-looking statements are based on reasonable assumptions, it can give no assurance that its expectations will be attained. USA Mobility disclaims any intent or obligation to update any forward-looking statements. 24th May 2005, Basingstoke, UK and Washington, DC. Multitone Electronics plc and Multitone North America, Inc announces the launch of AlarmCentral™, the latest addition to a suite of leading-edge solutions designed to interact with Wireless Messaging Networks to deliver centralized, failsafe alarm monitoring and control. AlarmCentral is a highly reliable application, offering a solution to the challenging problem of centralising data from diverse alarm systems and distributing the resulting messages via Wireless Networks. AlarmCentral has been developed as a result of Multitone’s close co-operation with one of their major customers, the UK National Health Service, which operates more than 600 hospitals throughout England, Scotland, Wales and Northern Ireland. Within NHS Lothian, there was a need to provide a safe, reliable remote Alarm Monitoring process to ensure that appropriate responses could be made in the event of a Fire, Medical Gas, or Intruder Alarm activation at the Western General Hospital in Edinburgh. 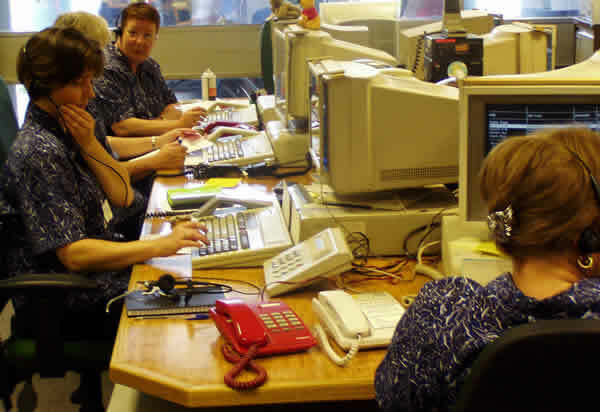 The Telephone Operators, who had traditionally monitored such alarms, were to be re-located to a new building some miles away and the Multitone Remote Alarm Monitoring solution was deployed to ensure that all of the safety criteria were met. AlarmCentral monitors the alarms in varying formats e.g. RS-232 or closing contacts and delivers them to another site where they can be distributed by Multitone’s PowerPage paging terminal, or another wireless network for action by emergency response teams. The system works over existing hospital communication links such as LAN/WAN or PSTN and all links are monitored for reliability. The system provides back up bearers should any link fail and automatically re-routes the alarm and provides logs and statistical data. The system has proved to be extremely reliable and is very easy to operate. We can now provide a high quality Alarm Monitoring Service from a Centralized Operator Location that is remote from the site being monitored. The Multitone system will now be deployed to other locations throughout NHS Lothian as we continue to improve our Telecommunication services. Central display offers audible/visual/SMS/E-mail/Paging—multi-functional Messaging. No action results in escalated alarms—safety and reassurance that an alarm will not be missed nor ignored. The system offers major cost savings for NHS Lothian as well as enabling centralised services to be implemented easily and safely. The system has also been installed at other sites in the North East and South of England. The centralised alarm solution is one of many new and exciting products recently introduced by Multitone. Other solutions include a new network/client messaging platform, PowerPage Power Server Suite, which offers many new facilities for communicating with both on-site and off-site devices and the new PowerPage 750 Pagers, featuring Alpha-numeric Messaging, One-Way and Stored Voice Messaging. Motorola Inc. has taken an undisclosed stake in a wireless directory assistance firm created by Dean Becker, the local paging pioneer who founded Becker Beeper. The startup, called 422 Inc., connects callers to cell phones, traditional phones and email addresses by calling 4-2-2. The West Palm Beach, Florida-based firm’s service is slated to launch by the end of this year. Motorola, the Schaumburg based-cell phone maker, has been working with 422 for the past year at the start-up firm’s research facilities in Rochester, NY, and Florida. The California-based venture capital firm Draper Fisher Jurvetson and DFJ’s Gotham Ventures have already invested an undisclosed amount in the company. Mr. Becker also owns a stake. Instead of tracking someone down by where they live, the 422 service will be able to find someone by where they work, where they went to school and other identifiers. Callers are connected via an operator and both parties’ phone numbers are kept private. Cell phone users enroll by signing up with their wireless carrier (Mr. Becker says those agreements are slated to be in place by the fourth quarter) or enrolling online. The system is “opt in,” meaning callers who don’t sign up won’t have their numbers included in the database. The white pages and yellow pages listings will also be available. "Companies have been trying for years to get something like this going," says Jeffrey Kagan, an Atlanta-based telecom industry consultant. "A lot have tried and failed. At some point the marketplace will be ready, especially as more and more people turn to their cell phones as their primary phone." A former resident of Highland Park, Mr. Becker started 422 in 2001 with technology created in his previous local venture called Ewireless Inc., which connected cell phone users to advertisers by dialing #333. He sold Becker Beeper, founded in 1979, to Massachusetts-based Arch Wireless Inc., then Arch Communications, in the mid-1990s for $40 million. SARASOTA, FL – xG™ Technology, LLC moved its promising spectrum sharing technology out of the lab and into the field, successfully conducting its first long-range wireless tests of xMax – a novel radio frequency (RF) signaling technique that represents an entirely new approach to the problem of spectrum overcrowding. Using only a VHF paging channel and negligible power in adjacent sidebands, an xMax transmitter and receiver pair with ground level antennas delivered data to the xMax receiver over a mile away. Ground level testing presents an extraordinary challenge: the signal must travel through buildings and other obstacles without significant loss or distortion - a feat that more common microwave-based wireless broadband techniques have difficulty achieving. Later this year, xG will release reference designs for sub-Gigahertz fixed wireless base stations and customer premise equipment (CPE) based on current working prototypes that could outstrip the capabilities of technologies like WiMAX. Unlike other wireless technologies that move as much power as possible from the carrier into the information-bearing sidebands, xMax does just the opposite, placing more than 99 percent of its power within a narrowband carrier while keeping its sideband energy at micro-power levels. Typically –60dB to –100dB below the carrier, xMax’ unique information-bearing sideband, dubbed xG Flash Signal™, can be as much as 100,000 times below the Federal Communication Commission’s (FCC) “Part 15” regulations. Lower frequencies – located below one Gigahertz on the spectrum – are well known by communications engineers to outperform higher frequencies. The performance shortfall is so stark that it can take 25-50 times more towers to wirelessly cover a given area using Gigahertz frequencies. The problem, however, has been that lower frequencies have been divided into small segments for thousands of disparate uses. This overcrowding of the lower spectrum has left wireless broadband service providers with no other option than to shift to higher frequencies — accepting a hefty price/performance penalty. Last year, SkyTel launched an Automated Vehicle Locator (AVL) product designed for commercial fleets. One of the comments they heard throughout the year was "I need one of these for my teenager!" And SkyTel listened. Now, SkyTel has launched the latest in their AVL line: SkyGuard—a new vehicle tracking device made especially for parents of teenage drivers seeking peace of mind about their children. SkyGuard uses GPS and ReFLEX technologies to automatically collect location, speed and other vehicle data—and relay that information to a secure SkyGuard website, where a parent can view maps and reports. Developed end-to-end by SkyTel, the system combines a wireless GPS/ReFLEX device with a proprietary SkyTel-hosted website for viewing the vehicle data. The SkyGuard device connects to the vehicle’s ignition and power, and can be easily installed under the vehicle dash. Once installed, it automatically begins recording location and speed every time the engine is turned on. The device takes a reading every two minutes, then transmits the readings to the SkyGuard website every ten minutes. 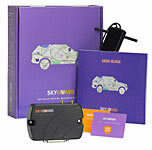 The customer can then log onto the SkyGuard website, and see where, and how fast, the vehicle has been traveling. From the website, they can also draw Zones around specific locations. This lets parents know when their kids get where they should be (like school, or home after school), or when the kids go where they shouldn't. The system will send alerts to any email address—including cellphones and pagers—so customers can be alerted if the driver is constantly speeding, or if he’s at the mall instead of the study group. In addition to providing location and speed information, SkyGuard can also connect to vehicle's door locks so that doors can be unlocked remotely, and to the engine's starter system. In the event of theft, the customer can disable the starter so that the engine, once stopped, cannot be re-started. SkyTel has also added a new AVL feature just for this SkyGuard product. When customers are away from the internet, they can call the SkyGuard "Remote Assistant" operator to unlock doors, locate their vehicle or disable the starter. SkyGuard is available through the SkyTel website or at agent locations. Yesterday was May 24th and I noted that it matched the day in 1940 when I was born, at least according to my drivers license. That means I have reached the age of 65, retirement age to many in our society. So I am going to greet this milestone by doing just that. I am putting aside my 40+ years of being involved in the radio paging industry to move on to other, perhaps more vibrant things. Since my first exposure to paging in the 1960s I have watched, and in some form, participated in the ebb and flow of this technology. It has played a key role in our society bringing aid to those in need, alerting us to important, and less important events and generally, like Pavlov's dogs, triggering some preconditioned response at the sound of a beep. But now, our society, and that of much of the world have moved on to other, perhaps more intrusive technologies to bring some additional forms of control to our lives. It is time for me to move on too. I will look forward to continuing my work in supporting public safety and law enforcement agencies, helping bring them some small bits of technology that allow them to better do their work for all of us. Consulting on selected (fun) projects will still be in the plans. My plans call for more time for Amateur Radio and learning to become an RVer. Much of my professional life allowed me the pleasure of traveling and exploring our beautiful country and I want to do it again, but at a slower pace where Judi and I can enjoy what we see and who we are with. After all, we have four grandchildren who need a well versed tour guide to many of the wonders of the world our daughters saw as incidental travelers on Dad’s business trips. We want to continue that role. I wish you all the best of what life has to offer and for those still immersed in radio paging, continued success in your endeavors. I know that paging will continue in some form to provide that alert at the right moment for many. As always I enjoy your emailed newsletter comments. With regards to USA Mobility, posting of their planned business direction in response to current market trends for all to see was a class move. Especially since they are a publicly held company that is trying to maintain stockholders. USA Mobility's view of where to find customers and the potential for maintaining market share/business duration is real. That's what bothers us little guys in the business. What I believe hasn't been addressed in this industry is the fact that there have been so many mergers, closures and failures in this industry that the private sector, Medical, Governmental and such are once again giving preference to operating their own local paging systems. I've even run into a small city fire department that stated their insurance underwriter and emergency response classification system "downgrades" them for relying on a public operated paging system. This in effect raises their insurance rates. And that's in Kansas. 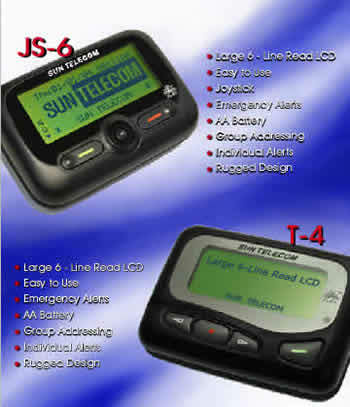 They now operate 2 tone voice pagers on their radio system in place of alpha digital pagers that do so much more. Thus, the prospects of maintaining the more desirable government based accounts is in jeopardy from external forces (no relation to star wars) that have nothing to do with the competition. Soon, the reliance on one way or two way paging will be replaced by phones or other devices that will do even more than we presently can imagine having a need for. Kind of like why we drive cars instead of riding a horse n buggy (unless you live in Yoder, KS). I know that it's hard for me to justify any increased paging infrastructure expenditures or expansion. My supplier of Unipage parts even told me that the market value of these systems is becoming the same as old computers, very little demand. So now I know that the planned obsolescence of my original 1990 investment is very real. Many of the smaller paging system operators will outlast USA Mobility, however, we will experience the negative effects of customer revenues losses just the same. Have a great day and keep up the good work on your newsletter. Brad: I had to laugh about your "damned if you do, damned if you don't" article on USMO. We veterans have long ago learned there is often a long distance between reality and stock market fluff, but the rules are set by the investment community and not the public company and we just have to live with it. USMO certainly has an experienced team to meet the challenges of today's paging world. One of the sweet mysteries of life has always been reported RPU's. Pagenet continually reported RPU's in the $8-11 range, but we never saw them sell at anywhere near that price. Even today, the average numeric price (rental/service) we see in our west coast markets is $2.50 - 4.00, and text messaging around $3.75 - $6.00 . . . a far cry from what we see being reported. But then Nextel reports average RPU's at close to $70 per month, and yet we generally see them marketing their products to small businesses in the $10-24 per month range. I can only say its the magic of accounting. . .
Keep reporting all the news! I am pleased to announce that the PTC has approved Version 1.3 of the WCTP protocol. The final vote was 13 approve, 1 disapprove and 3 no votes. It is very important that the PTC continue to review and enhance the protocols used by the industry. WCTP is being used right now in many areas and these enhancements were a culmination of several enhancements developers needed in order to generate new business within the paging community. I'd like to thank the members who devoted their time working on this through the PWG (Protocol Working Group) and urge all members to join in when possible. The PWG will be meeting on June 1st in Myrtle Beach to continue working protocol issues. 1) Discuss and list functionalities to next WCTP release. While the Bureau also stated in the January Public Notice that it anticipated implementing this automated feature in June 2005,4 we are postponing the implementation of the ULS automatic termination feature until Fall 2005, allowing additional time for licensees to submit late-filed construction notifications along with requests for waiver of the notification deadline. As we have previously stated, of the Bureau’s primary objectives prior to implementing the ULS automatic termination program is allow adequate time for outreach to the public to provide additional information about the automatic termination process. As part of that outreach, the Bureau stated in its January Public Notice that licensees that have met their construction or coverage requirement in a timely manner, but have failed to submit the required notifications, should file an FCC Form 601, Schedule K, together with a request for waiver of the rule section that requires timely filing of the notice.5 We again encourage have not yet submitted construction notifications to use this additional time to do so. The Bureau is also announcing that is has enhanced its ULS License Search by feature that searches on build-out deadlines. The new search, available this week, will locate licenses, locations, and frequencies where they have failed to submit a notice of timely manner or locate licenses with upcoming deadlines. Specifically, the Bureau has License Search feature in ULS allowing the public to locate licenses that have construction deadlines within a specific date range, not to exceed six months. Once the date range is search can be further customized by using a FCC Registration Number (FRN), licensee service, radio service group, or auction ID. In addition, the licensee can narrow the search or coverage deadlines for which a notice of construction has not been filed, deadlines for of construction has been accepted, or by using both criteria. The results will be displayed, license searches in ULS, at the license level and will include any license, any location within any frequency within a license that meets the search criteria. On a going forward basis, believes this enhanced License Search feature in ULS will assist licensees in filing notices in a timely manner. For information on construction or coverage requirements or how to file a notice or a request for an extension of time, visit the Web at http://wireless.fcc.gov/licensing/const-req. Have a question? Visit the Web at http://esupport.fcc.gov or call the FCC Support Center at (877) (TTY 202-414-1255) and select Option #2, Forms or Licensing Assistance. Hours for Center are from 8 a.m. to 7:00 p.m. Eastern Time, Monday through Friday (except Federal provide quality service and ensure security, all telephone calls are recorded. 1 Wireless Services are listed in Section 1.901 of the Commission’s Rules, and include certain services under Parts 13, 20, 22, 24, 27, 74 (Subparts D, E, F, and H), 80, 87, 90, 95, 97, and 101 of Title 47. See 47 C.F.R. § 1.901. 2 Wireless Telecommunications Bureau to Enhance its Universal Licensing System to More Accurately Reflect Termination of Unconstructed Licenses, Public Notice, DA 05-137 (rel. Jan. 21, 2005). 3 The January 21, 2005 Public Notice describes in detail the complete ULS process that would lead to the automatic termination of a license, location or frequency in ULS. Public Notice at 1-2. 4 January Public Notice at 1. 5 January Public Notice at 2-3; 47 C.F.R. § 1.946(d). PLANO, Texas – SyChip is offering the VWLAN7100 Voice-over-Internet Protocol (VoIP) CSM, the first in its SyVoice™ family of products for feature phones, smart phones and PDA Phones. The VWLAN7100 CSM is a complete end-to-end Voice over Wireless LAN solution that can be quickly integrated into mobile phones to support the emerging dual-mode cellular and local area networks. "SyVoice is our family of highly integrated and programmable modules that is targeted to the VoIP market. We're excited to release this product as the convergence of cellular and WLAN is rapidly taking hold in the wireless market space," said Moses Asom, co-founder and senior vice president of marketing and business development at SyChip. "We have one of the first products that is specifically targeted to the dual-mode cellular phone market." The VWLAN7100 CSM is a complete plug-n-play solution that includes all the hardware and software necessary to add VoIP and data functions to a standard cell phone. The module allows a mobile phone to roam between a cellular network and a WLAN network, giving the user the flexibility to maintain the most cost effective voice connection. The module also allows a high-data-rate data connection over a WLAN network for standard data functions like Web browsing and email access. "Market interest for dual-mode phones combining cellular and Mobile VoIP technology has seen an upward growth this year and will explode with adoption over the next few years," said J. Gerry Purdy, Ph.D., principal analyst of MobileTrax. 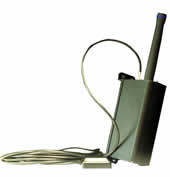 "SyChip's SyVoice product offers an elegant combination of voice and Wi-Fi in a single module. The implementation of multiple filtering technologies and a VoIP engine deliver a solution that addresses both quality of voice and service, as well as an efficient use of battery power." 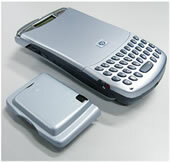 Long battery life is a critical requirement for mobile phone manufacturers. The SyVoice VoIP engine is optimized to reduce power dissipation by offloading all the functions necessary to maintain a VoIP call from the host processor. The VoIP engine consumes only 18mA of current during a call, allowing phones to have talk times of more than five hours and standby times in excess of 100 hours. 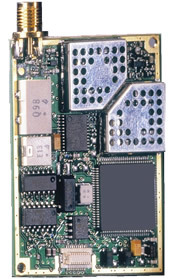 VWLAN7100 combines a VoIP processor and an 802.11b/g WLAN modem. The module is designed to easily interface with most baseband and application processors on the market. The module also incorporates software features such as a SIP 2.0 stack; VoCoders G.711, G.729AB, G.723, G.726, jitter buffer; call control functions including origination/termination, forwarding, waiting, hold, transfer and 3-way; audio control; and IPSEC. SyChip will provide the driver to support operating systems such as Rex®, Windows Mobile®, Linux®, Nucleus® and Symbian® Operating Systems. The WLAN section of the CSM supports features such as WMM®, Quality of Service (QoS) traffic prioritization critical for VoIP and multimedia applications, WPA2 (IEEE802.11i) security and Bluetooth co-existence. The VWLAN7100 will be available for general sampling in July and comes in a near Quad Flat No-Lead (QFN) package that allows for direct attachment to the main printed circuit board using industry standard surface mount technology. Pricing for the modules will be below $20 per unit in volumes of 10,000. 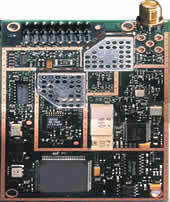 For more information on VWLAN7100, or other SyChip product, please visit http://www.sychip.com/products.htm. PARIS (Reuters) - Internet phone services company Skype will launch new services this year, including video calls, cheap corporate calls and a dedicated Wi-Fi phone, and expects to be cash-flow positive in 2005, its chief executive said on Wednesday. Niklas Zennstrom, head of the privately held Luxembourg-based company, said 39 million people were using its free software to make free calls over the Internet, while it was attracting 150,000 new clients every day without any advertising of its own. Of those users, 1.4 million are also paying for services that allow them to make Skype calls from their computer to a normal phone, or from a normal phone to a Skype user, Zennstrom told the Reuters Telecoms, Media and Technology Summit. Zennstrom, whose business is seen as one of the biggest threats facing telecoms operators, said take-up of the new pay services was progressing as expected. Although subscribers only pay a few euros, these revenues would help to make the 2-year-old start-up cash-flow positive this year, he said. "That's the case," he said, when asked if his company would be cash flow positive in 2005. The company has not yet given any indication about its profitability. Well, not exactly next week—week after next—since I will be attending the AAPC Wireless Forum in Myrtle Beach, South Carolina next week. It is going to be terrible! Staying is a beautiful hotel on the beach of the Atlantic Ocean, having great meals, meeting with old friends and making new ones. You know how the old saying goes, "it's a tough job, but someone has to do it." But who knows, maybe I will meet a rich widow while I am there. Success and failure share a common denominator — both are temporary!